IR spectra showing carbon dioxide and methane taken as proof of the discovery of exoplanets orbiting distant stars is questionable as the spectra actually depict the redshift of UV radiation absorbed in the dust of debris haloes. YOUNGWOOD, Pa. - Dec. 8, 2014 - PRLog -- . Recently, Optics & Photonics  reported the discovery  of 4 planets orbiting the distant star HR8799 thereby supporting the theory that exoplanets surround other stars in the Universe consistent with the planets that orbit our Sun. 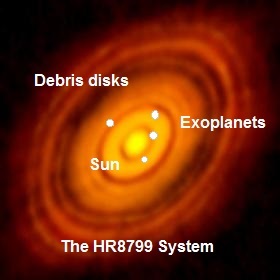 See The HR8799 System depicted in the thumbnail. Unlike our Sun, HR8799 is a young star containing cool dust in debris haloes thought shaped through dynamical interactions with the planets. IR spectroscopic measurements of the suspected planets in the wavelength range from 995 to 1769 nm identified ammonia from 1450 to 1550 nm, acetylene from 1500 to 1550 nm, methane above 1650 nm, and possibly carbon dioxide from 1560 to 1630 nm, all of which are commonly observed in the atmospheres of planets in our solar system. However, the IR spectra showed the following anomalies. 1. Generally, the large features of the IR spectra of HR8799 planets were broadband with superposed small features identifying the molecular lines of gases. Surprisingly, the spectra of the planets expected to be similar were not. Further, the molecular lines of carbon dioxide  and methane  at 800 K should have been found in all spectra, but were only observed for two planets. Moreover, the IR spectra of one planet was variable, i.e., the presence of a weak carbon dioxide line initially not present appeared 4 months later. 2. The spectra of the planets were all reddened. Similarity of HR8799 planets and the 2M0355 brown dwarf spectra suggests dust reddening  by Rayleigh scattering. But dust was dismissed  because Rayleigh scattering by dust of near IR molecular emission was not expected to modify the small features of planet spectra. Anomalies 1 and 2 taken together suggest the spectra of HR8799 system are not produced by molecules on the planets. What this means is the IR spectra taken as proof of the discovery of the exoplanets is questionable. But this is not new as dust affects all astronomical measurements. E.g., if gas is present, planets have been shown  not necessary to form sharp eccentric rings in the debris disks of the star, i.e., exoplanets need not exist. Stars like HR8799 emit high intensity UV radiation that can only be absorbed in the dust of surrounding debris haloes. The problem is no mechanism is known to convert UV radiation, say Lyman-α photons, to near IR radiation upon absorption in the dust of debris haloes. Classical physics requires NPs absorbing single Lyman-α photons to increase in temperature. On this basis, astronomers derive the IR spectra in the interstellar medium. QM differs. Since the NP temperatures cannot change by QM, the absorbed Lyman-α photon may only be conserved by QED creating a single redshift photon inside the NP. However, QED does not create single blueshift photons as the conservation of energy would be violated. Since NPs have high surface to volume ratios, almost all of the Lyman-α energy is concentrated in the NP surface. Hence, the QED induced photon is spontaneously created as a wave standing between diametrically opposite points on the energized NP surface. Because of the high surface to volume ratio, the absorbed Lyman-α photon is momentarily confined inside of the NP. The QED redshift photon therefore has wavelength λ = 2d n = 4a n, where n, d, and a are the refractive index, diameter, and radius of the NP.The TIR frequency f = c / λ, where c is the velocity of light. What this means is QM requires the single Lyman-α photon energy absorbed by a NP to be conserved by the creation of a QED induced redshift photon at the TIR frequency of the NP. Unlike the Doppler effect, QED redshift may occur with the NP stationary and need not moving. QED radiation in NPs produces near IR spectra similar to that of common molecules at high redshifts Z of Lyman-α photons having wavelength of 121.7 nm. For amorphous silicate NPs having n = 1.5, the QED redshift Z = 11 at NP radius a = 0.25 microns. See Ibid, Fig. 2. The wavelength λ of the redshift Lyman-α photon is 1460 nm which is in the range of acetylene. NPs having a = 0.25 microns are at the upper range of known dust distributions. E.g. methane having wavelengths > 1650 nm is observed at Z = 14 and NP radii > 0.275 microns which is a reasonable extension of known dust distributions. Consistent with observation, the IR spectra has nothing to do with a molecular species, but depnds on the size distribution of cosmic dust. Exoplanets orbiting a distant star may exist, but any discovery cannot be proven using IR spectra of common planetary gases. Stars emit Lyman-α radiation that is absorbed in dust NPs of debris disks. Hence, dust NPs redshifting Lyman-α radiation to the near IR could falsely be interpreted as proof of exoplanet discovery - when in fact the exoplanet does not exist. J. Hecht., “Exoplanets: Getting a closer Look,” Optical Society of America, Optics & Photonics, vol. 25 (11) pp. 42-49 (2014). B. R. Oppenheimer, et al., “Reconnaissance of the HR 8799 exosolar system I: Near IR spectroscopy,”Astronomical Journal (2013). M. F. Modest & S. P. Bharadwaj, “Medium resolution transmission measurements of CO2 at high temperature,” J. Quan. Spect.&Rad.Transfer, vol. 73 pp. 329-338 (2002). R. Nassar & P. Bernath, “Hot methane spectra for astrophysical applications,” J. Quan. Spect. & Rad. Transfer, vol. 82 pp. 279-292 (2003). J. K. Faherty, et al. “2MASS J035523.37+113343.7: A young, dusty, nearby, isolated browndwarf resembling a giant exoplanet,” Astronomical Journal, vol.145(2) pp. 1-11 (2013). W. Lyra & M. Kuchner, “Formation of sharp eccentric rings in debris disks with gas but without planets,” Nature, vol. 499 pp. 184-187 (2013).